So it’s time to confess. I’m fascinated by the various things that people carry around with them. Whenever there’s a “what’s in my bag” Instagram challenge or hashtag going around I get totally drawn in. They say a woman’s hand bag is a window on her personality! So here’s the junk I lug around with me every day! Now that I am working in the city I have an hourlong commute on the bus, so what I bring with me has changed dramatically! My pink and white striped umbrella in case of rain. This thing is ancient and desperately needs replacing. A napkin, because I hate the wastage of paper towels and don’t see why I can’t use the real thing, even at work. My Kath Kidston wash bag which now has a new purpose! I’m trying hard to reduce the use of plastic in my home, but carrying containers of leftovers without them being wrapped up in a plastic bag has been fraught with difficulties! My solution is to put my lunch into this old wash bag which has a waterproof lining 😊. Fur-lined fingerless gloves to keep me warm walking to the bus stop. My beloved MacBook Pro goes almost everywhere with me! As does my iPhone. I keep my earbuds in this little pink pouch to stop them tangling. A notebook, notepad and fountain pen. 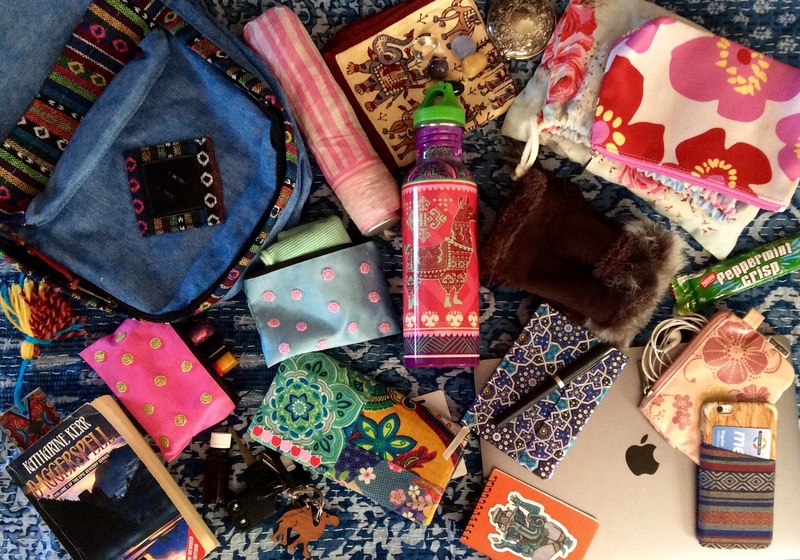 The little blue silk pouch holds a microfibre cloth to clean my glasses with….essential especially when it rains! Wallet – upcycled nicely now, as per last week’s post! Keys. My mum and dad brought the adorable little wooden camel key ring back from a holiday in Broome. Essential oils…..this is a blend of Spike Lavender, Hyssop and Frankincense, which is an amazing cold and flu remedy. The little pink silk pouch contains lip balm and lipstick. And finally I get a couple of hours a day now to read which makes up for the long commute as I’m getting to read a lot more often! This is an old favourite, the first in a series of about 15 books. I’m really looking forward to re-reading all of them! the washbag/lunchbag idea is inspired! I’m just the same with ‘what’s in the bag’ things – youtube especially when it feels like a real life rummage through! It’s so true – it’s a real insight into a person’s thinkings, what they choose to carry around with them! Lovely post – thanks for the tour!! The washbag has saved me so much grief! haha I call it *research*! !